It’s cutthroat. It’s intense. It’s every man for himself. For many millennials, “Mario Party” is a nostalgic aspect of childhood. Picking your favorite character, arguing with your siblings over what board you’re playing that night or how many turns your game will be. In some cases, getting violent because you were only one space away from the star but your little brother miraculously rolled a 10 and got there before you. As iconic as Nintendo’s “Mario” universe is, however, it’s had some ups, like the iconic “Mario Party 4,” for example, and a few downs, mostly the infamous “Mario Party 10,” yikes. 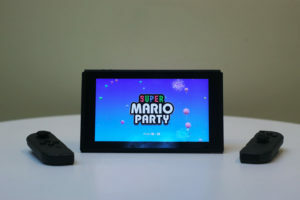 But with the recent release of “Super Mario Party” for the Nintendo Switch, the game has been changed for the better and seems to be taking steps in a refreshing, innovative direction. Unlike in previous “Mario Party” games, character selection actually matters this time around; each character has their own unique six-sided dice block, alongside the standard, traditional dice that goes from one to six. For example, if you decide to play as Monty Mole, you can roll any number between two and six, or stay stationary and gain one coin. If you play as Shy Guy, you have one chance of rolling a zero, or five shots at rolling a four. There is also a chance that you could lose coins; if you play as Boo, you have two chances at losing two coins, two chances of rolling a five, and two chances of rolling a seven. Another unique feature of “Super Mario Party” is that along one’s journey to the star, you are able to pick up another player as a sort of buddy that stays with you for the remainder of the game. The perk to this is that you get an additional dice block to choose from, depending on who your buddy is. For example, if you were to pick up Rosalina along the way, you could pick from either a normal dice block, your character’s dice block, or Rosalina’s. Another new feature of the new party game is that the maps aren’t quite as linear as they used to be. In this case, players are able to choose which direction they move with their respective dice rolls rather than following a strict path. The game also has a grid-based two vs. two mode, called Partner Party, but unlike in previous games, players cannot work as teams in the main party mode. There are more gameplay options in “Super Mario Party” than in previous games, as well. For example, there’s a mode called “River Survival” in which players work as a team to physically row to the end of the river, dealing with obstacles like Cheep Cheeps along the way, and popping balloons to play mini games for extra time. There is also an option called “Sound Stage” in which players compete by nailing dance moves. One of the best parts of every “Mario Party” is the mini games, and “Super Mario Party” doesn’t disappoint. Each mini game brings something new to the table, whether it’s due to the structure and use of the Joy-Cons or the ever-growing technological advancements. One of the mini games, for example, consists of shaking your Joy-Con in order to get candy out of a bottle. Another one is literally just grabbing the most pancakes out of a stack (but trust me, it’s really intense). The game also has new mini game modes if you’re not so into the idea of going on a journey for stars and coins, but you’d rather kick your friends’ asses in a quicker, less complicated method through means of territory stealing. “Super Mario Party” is arguably the best game on the Nintendo Switch thanks to its classic yet refreshing setup and plethora of new features and mini games. It brings the familiar fun of “Mario Party” to a new console with new gameplay methods, and it does so flawlessly.